Seems like I always need to capture something off my screen. Mac OS X has built-in tools to take these pictures, but they're rather primitive. On my new MacBook Pro, I've been using SnapNDrag. It's free, runs on both PowerPCs and Intel Macs, and is a joy to use. The problem with the built-in screen capture on the Mac -- SHIFT-CMD-3 for full screen and SHIFT-CMD-4 for selected area -- is that you don't have any real controls for after you make the capture. You can open the image in Preview and change the format, but it's a little cumbersome. And it seems that whenever I need to make a screen capture, I'm in the middle of a project and in a hurry. SnapNDrag gives you many more options. In addition to the selection tool and full screen capture, SnapNDrag provides you with a handy Window capture, which is very convenient for taking pictures of menus and dialog boxes. You can choose your image format -- Jpeg, Png, Gif, or Tiff -- at the time of capture, and even scale the image based on four presets -- 100, 75, 50, or 25 percent. Plus, it just works great. 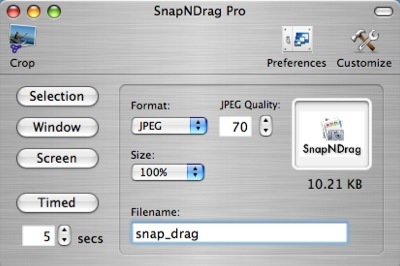 A handy companion for SnapNDrag is EasyCrop. You can trim your screenshot (or any other image you have), rotate it, scale to any percentage, and set the quality. If you buy EasyCrop for $11.95, you get the upgraded Pro version of SnapNDrag for free. Both SnapNDrag and EasyCrop are nimble image tools that I use a lot, especially when I want to work quickly.